While the prison site remains mostly forgotten—commemorated by a set of obscure markers—a much more poignant reminder of that place of terrible memory sits on the other end of town. 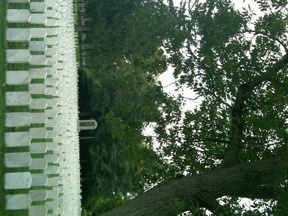 Woodlawn National Cemetery rests on ten and a half acres of land. More than 9,000 U.S. veterans and their family members are interred there. So are the Confederate dead from the Elmira prison. Rather than ship the bodies of the Confederate dead home, Federal officials chose to bury the bodies adjacent to the city’s Woodlawn Cemetery. 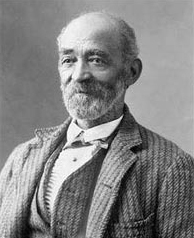 John W. Jones, a former slave who’d run away to freedom and now lived in a caretaker’s house across the street from the cemetery, was responsible for overseeing the burials. Jones had become sexton for the cemetery in 1859. For nearly a decade before that, he’d helped shepherd other runaways to safety as a “conductor” on the Underground Railroad. Jones received $2.50 for each burial he performed. 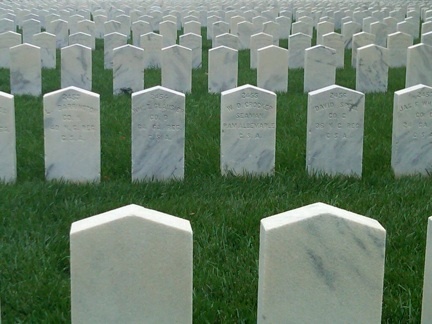 He erected a hand-painted wooden marker, featuring the name of the deceased, on each grave, and he kept records that included each Confederate’s name, rank, company, and regiment, and date of death. 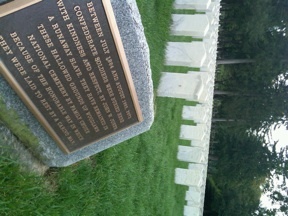 The graves stretch out in neat rows. Near the head of the plot stands a monument, erected by the U.D.C. 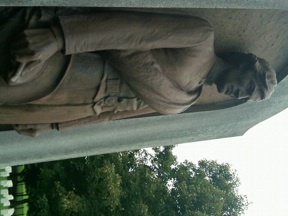 in 1937, that features a bronze relief of a Confederate soldier who overlooks the Southern dead. “That statue depicted a healthy middle-aged man, fully clothed with hand in hand and good shoes—features atypical among Elmira inmates,” points out historian Michael P. Gray in his book The Business of Captivity: Elmira and Its Civil War Prison. There’s also a memorial, erected in 1911, to commemorate the 44 Confederates and 17 Federals killed in a train accident in Shohola Township, in Pennsylvania’s Pike County. Some 800 Confederate POWs were being transported to Elmira from Camp Lookout, Maryland, when their train collided with a coal train. The engineer, the brakeman, and two firemen also died in the crash. For forty-seven years, the dead lay interred in an unmarked grave next to the tracks where the accident took place, but they were eventually disinterred and moved to Woodlawn. Woodlawn National Cemetery sits adjacent to the city’s own Woodlawn Cemetery, from which the National Cemetery takes its name. In the city cemetery, on a knoll to the west that overlooks the Confederate dead, Mark Twain’s grave sits under the wide canopy of an old oak tree. Twain’s wife, Olivia, came from Elmira, and the family often summered there. Twain wrote some of his most famous works, recollecting the lost days of the antebellum South, while living at the family’s hilltop Quarry Farm. I wonder what Twain—who deserted from the Confederate army—would think of the regimented rows of graves, Confederate POWs surrounded by Union soldiers—indeed, soldiers of many wars, intermingled with each other across the cemetery’s ten-acre expanse. “All war must be just the killing of strangers against whom you feel no personal animosity; strangers whom, in other circumstances, you would help if you found them in trouble, and who would help you if you needed it,” Twain once wrote. Here in Elmira, in this place of terrible memory where the prison camp once stood, a runaway slave buried the bodies of men who had fought to preserve a system that would’ve kept him enslaved. Jones saw strangers in trouble and helped them, when they needed it, to find rest. The rows of markers stretched across the green lawn, surrounded by their fallen foes, spell out that story and call to us to remember. This entry was posted in Battlefields & Historic Places and tagged Civil War prisons, Elmira, National cemeteries, Woodlawn National Cemetery. Bookmark the permalink. Beautifully done–and a lovely remembrance for Veteran’s Day. Thank you for sharing your experience. It is important for us to remember just “who” was (and still is) caught in the midst of war. I am interested in the History of Hellmira, my great-great grandmother Chloe Ann Brinsmaide served as a nurse there during the war, at this prision, while there her husband Nathan was off fighting the war. She got in trouble when she was caught wetting the leather ties on the prisioners who were put on four stakes in the sun, then tied to the stakes where as the leather dried they would basically be pulled in all four directions. By wetting the straps she kept them from being pulled apart. My grandmother told me this story, she remembered her grandmother telling her the stories of what she had done. Thank you for sharing this historical account with others.